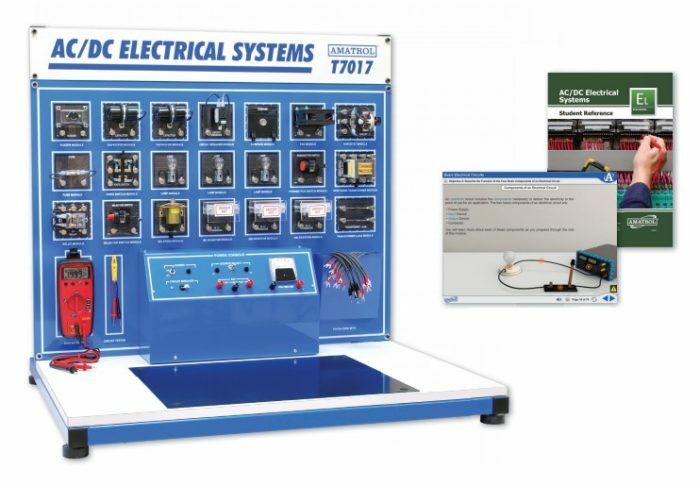 Amatrol’s AC / DC Electrical Learning System (T7017A) explores the fundamental concepts of AC and DC electrical systems. Learners will see how electricity is used for power and control in industrial, commercial, agricultural, and residential applications. This training system covers industry-relevant technical skills including how to operate, install, design, and troubleshoot basic AC and DC electrical circuits for various applications. This AC/DC electrical training system features a heavy-duty welded steel frame with built-in AC and DC power supplies, instrumentation, component mounting surface, and component storage panel. It features industrial size electrical power and control components, typical of what students will find in the field. Learners will use these components to practice hands-on skills such as operate a circuit using a circuit breaker, test a capacitor using a digital multimeter, connect and operate a basic lighting circuit, locate a short circuit, and troubleshoot a transformer by measuring continuity. The T7017A’s curriculum begins with the basics of electricity and builds to show learners how electricity is utilized in residential applications, as well as in industrial components and areas such as programmable controllers, electrical motor control, and electro-fluid power. Learners will study topics such as how to use a voltmeter to measure voltage, stating a formula for calculating total parallel resistance, the functions of four electromagnetic devices, how switches and used in combination circuits, and how to troubleshoot a transformer. This electrical training course is presented in an interactive multimedia format, which features stunning 3D graphics and video, audio voiceovers of all of the text, and interactive quizzes and activities. The AC/DC Electrical Learning System also features a virtual multimedia trainer! Amatrol’s virtual trainers replicate hands-on equipment in such great detail that learners will feel like they are using the actual equipment. Learners will perform essentially the same tasks using virtual trainers that they would perform using equipment hardware. Transition from theory to hands-on is a seamless process.